Pictured are members of the 2017-2018 GCGS executive committee with state Rep. Robert Trammell, keynote speaker. L-R are Dr. Gale Starich, GCGS treasurer (dean of the Graduate School, Brenau University); Dr. Lisa Armistead, GCGS vice president (associate provost for Graduate Programs, Georgia State University); Dr. Loretta Clayton, GCGS president (director of Graduate Student Policy and Support, Middle Georgia State University); Rep. Robert Trammell, minority leader, Georgia House of Representatives; Nikki Palamiotis, GCGS secretary (assistant dean of Graduate Studies, Kennesaw State University); and Dr. Leslie Sharp, GCGS past president (associate vice provost for Graduate Education and Faculty Development, Georgia Institute of Technology). The Georgia Council of Graduate Schools (GCGS) held its fifth annual conference at the Marriott City Center Hotel in Macon on April 19-20. As the current GCGS president, Dr. Loretta Clayton, director of Graduate Student Policy and Support at Middle Georgia State University, organized the two-day academic conference. Panel discussion topics covered ranged from strategies to mentor and engage graduate students to conversations about developing new and innovative graduate programs and establishing strong partnerships within and across institutions. The keynote speech was delivered by Robert Trammell, minority leader of the Georgia House of Representatives. Trammell is the son of the late Robert Trammell Sr., who was the longtime dean of faculty and VP for Academic Affairs of what is now Middle Georgia State. The conference also featured the inaugural "Three Minute Thesis" (3MT) showcase, as master’s and doctoral students throughout the state presented their work as recent winners of 3MT competitions at their home institutions of Georgia State University, the University of Georgia, the Georgia Institute of Technology, and Kennesaw State University. Clayton also conducted the GCGS business meeting, which concluded the conference. This is her second year serving on the GCGS executive committee. During her tenure as GCGS president, Clayton organized the GCGS fall meeting of institutional representatives on the Macon Campus of Middle Georgia State in October of 2017.She will continue to serve on the GCGS executive committee in the 2018-2019 year in the role of past president. "The GCGS conference is a premier networking and scholarship event that afforded the opportunity to bring together in downtown Macon administrators, faculty, and staff who work in graduate studies across Georgia to share best practices, knowledge, and expertise,” Clayton said. Several special guests attended the conference reception, including new Board of Regents member W. Allen Gudenrath, Dr. Christopher Blake, president of Middle Georgia State; Dr. Jonathan Anderson, MGA provost ; and Albert Abrams, MGA chief governmental and external affairs officer. MGA faculty who presented at the conference include Dr. John Girard, Dr. Myungjae Kwak, Dr. Neil Rigole, Dr. Scott Spangler, Dr. Johnathan Yerby, and Mark Riepe, graduate assistant, representing MGA’s Master of Science in Information Technology program; Jerry Williams, representing MGA’s Master of Science in Business; and Dr. Chip Rogers, representing MGA’s Graduate Certificate in Technical Writing and Digital Communication. Dr. David Biek, dean of MGA’s School of Education and Behavioral Sciences, and Dr. Loleta Sartin, chair of the Department of Teacher Education and Social Work, also attended the conference, as did Dr. Amy Berke, chair of the English Department, Dr. Donna Ingram, chair of the Nursing Department, Dr. Kendra Russell, director of Program Innovation & Evaluation in Nursing, and Liz Douglas, graduate admissions specialist. They were joined by other MGA faculty and staff whose work in student success and library research serves graduate students in Information Technology, Nursing, Business, Education, and Technical Writing. 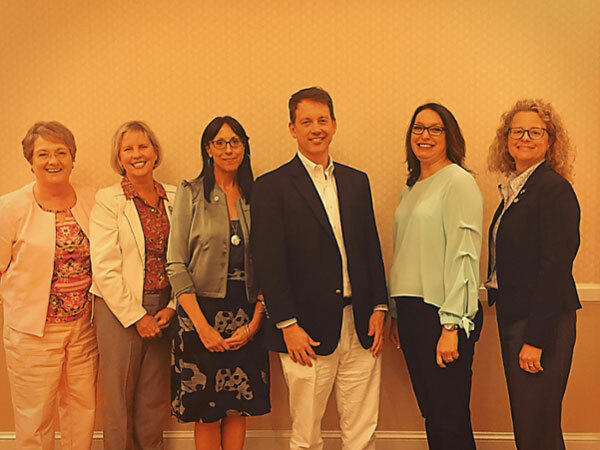 Funding from the MGA Foundation and the Office of Graduate Studies made possible the robust participation of MGA faculty and staff in this year’s conference. For more information about the GCGS, please visit the website: http://gacgs.org. For more information about graduate programs at MGA, contact the Office of Graduate Studies at 478.929.6712 or graduateadmissions@mga.edu. Visit the website: https://www.mga.edu/graduate-studies/index.php.